Born in Latvia. Emigrated to America as a child. Graduate of (Case) Western Reserve University in Cleveland, Ohio. Formerly a psychiatric social worker. Enjoys noticing the various problems that arise in life, as well as presenting them in a different, but learning form. The hope is to help add some betterment to life. In Scientific Fairytales for Children Book 2: The Tale of the Strange Ology Family by Silvija D. Lechowick, a mouse couple navigates the journey of life, marriage, and family. A wedding is the start of a beautiful journey and a promise of a happy future. So when two mice decided to get married, they hoped to live happily ever after with a big beautiful family. However, things did not turn out as expected. The newlyweds started their beautiful marriage with a lot of love and happiness but soon they were facing one problem after another. Even the arrival of their beautiful mouselings did little to change this. Could the mouse wife's parents have been right to be concerned? Was the marriage doomed forever or was there hope for a happy mouse family? 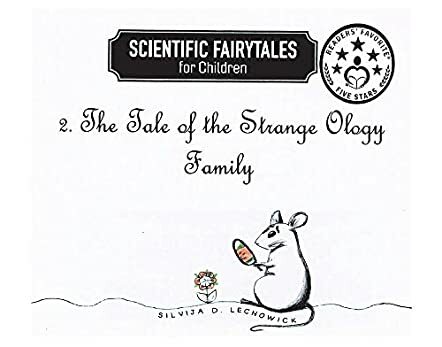 Scientific Fairytales for Children Book 2: The Tale of the Strange Ology Family by Silvija D. Lechowick is the story of love, family, and social challenges as seen through the life of a mouse family. In a fun way, the story addresses many challenges that we still face in the real world and also shares priceless lessons for both adults and kids. It touches on bullying, isolation, the importance of sharing our lives with our loved ones, and the great value of teamwork, and concludes with a beautiful message about how it is never too late to find true happiness. I absolutely loved the writing style. I loved how easy it was to connect with the story and the characters. It felt like the narrator was in front of me, telling me the story face to face. The conversational style of narration really made it a refreshing and fun read. This, together with the unique plot and the fun illustrations, brought the tale to life. Kids will absolutely love it and so will the adults who will read it to/with them. Scientific Fairytales for Children: Book 2. The Tale of the Strange Ology Family is an educational story book for children written by Silvija D. Lechowick. There was once a mouse and his wife who had married relatively late in life and had long wanted a family of their own. They almost didn’t get married, in fact, because the mouse-wife’s parents didn’t really approve of the mouse’s last name, which was Ology. What a strange name they thought it was, and how could they let their daughter get married to him and become an Ology herself? But, in time, they gave in, and the two were married. It was quite some time before they finally were blessed with a family; six healthy mouselings, otherwise known as pinkies. But what to name them? The mouse decided that his wife should have the honor of naming them. It took some time, but she eventually did name each of them. But the names she chose! He wondered why he ever let her name them. The story then becomes quite interesting. Silvija D. Lechowick’s Scientific Fairytales for Children: Book 2. The Tale of the Strange Ology Family is a cleverly disguised introduction to the scientific disciplines and theology for children. The author brilliantly casts each discipline as a young mouseling who then explores their namesake field. Her descriptions of what geologists, hydrologists, archaeologists and the rest do are brilliant; they simply and eloquently explain the fields in language kids can understand, and in ways that are bound to tempt kids to discover for themselves. The author also focuses on introversion and the tendency some kids, and adults, have to keep themselves to themselves. While the Ology family’s method of finally connecting is somewhat extreme, parents, caregivers and kids can indulge in some useful and practical ways to share interests after reading this book during story time. Scientific Fairytales for Children: Book 2. The Tale of the Strange Ology Family is most highly recommended. Scientific Fairytales for Children: Book 2. The Tale of the Strange Ology Family by Silvija D. Lechowick opens with a surprising wedding. The bride is twenty-five in mouse years but, even though she is considered “on the shelf” her parents are not happy for her; her fiancé’s second name is Ology! However, it is a long time in mouse years before they have six “pinkies” so, after getting less and less loving towards one another, Mother and Father should be over the moon. Father waits… and waits… for Mother to decide on names, but she is much too busy. At last, she yells “Ge, The, Bi, Arche, Hydr...and…and Zo”. This is when mature readers of this marvellous story for children realize there is a deeper meaning to the mousey story than one would expect. What could it be? Ge, The, Bi, Arche, Hydr, and Zo are very intelligent young mice. How could they not be when their names make Geology, Theology, Archeology, Hydrology, and Zoology? The family problems begin as the pinkies become teenagers; they follow their interests to the exclusion of everything else. Home is silent because they don’t talk, and although they do amazingly well at school, they don’t make friends. The studies of the individual teenage mice are fascinating, but it takes a disaster to make things happen. Silvija D. Lechowick has written a marvellous book for all ages in The Tale of the Strange Ology Family. I loved it, and I think it would be welcome in any school library, and would prompt discussion if it were read in class.